Part of me feels like I should watch A Christmas Story the movie before reviewing A Christmas Story: The Musical. Yup, it’s true – I have never seen this iconic Christmas film. And not because I’m Jewish I might add; we used to watch It’s a Wonderful Life every Christmas (we’ve since moved on to Love Actually). And even though A Christmas Story was always on TV, I never wanted to start in the middle. So now I have finally seen it – set to song and dance! 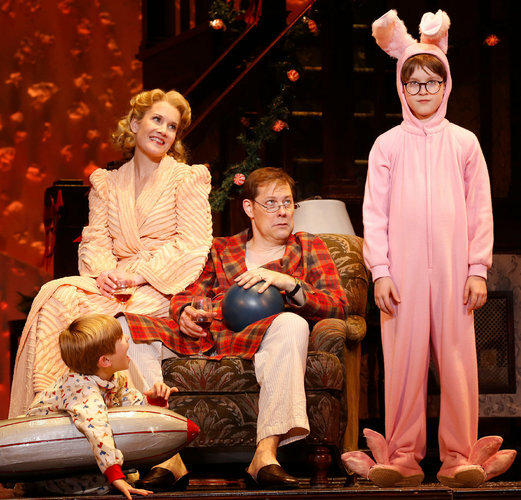 For those of you that don’t know, A Christmas Story came to Broadway last season, nabbed a few Tony nominations (Best Musical, Book, and Score), and has been touring around the country. It is now in the middle of a sit-down (a longer tour stop) at the Madison Square Garden theatre. And let me digress for a second here: Madison Square Garden is inSANE. I had never been inside (well, except maybe once as a kid), but it was like an amusement park. Our bags were checked, our persons frisked, we went up escalators galore, and encountered the enormous box office where they asked if I was picking up tickets for the musical or the Rangers game. The theatre itself has something like 5,000 seats! To top it off, they were selling cotton candy, crackerjacks, and popcorn as if we were at a baseball game. This place is quite the attraction. But anyway, back on topic, Becca. On the whole, A Christmas Story is a jolly evening at the theatre. While not a perfect show, it’s definitely solid – directed by John Rando (Tony winner for Urinetown), with smart musical numbers, a talented cast, and a cutesy book. The kids in the audience were having a blast, and you can hear everyone enjoying lines or scenes before they even happen because they already know the story. Matt and I, however, were in the minority. We didn’t know what was in The Old Man’s special delivery crate marked Fragile or whether Ralphie would get the BB-gun for Christmas, so it was fun to see a new story. The strongest part of the show is the score. As I mentioned in my Dogfight post last week, Pasek and Paul are where it’s at. These guys know how to write. Some highlights include: the opening, “It All Comes Down to Christmas”; The Old Man’s big song and dance number, “A Major Award,” featuring none other than a leg lamp kick line; and “You’ll Shoot Your Eye Out,” the big speakeasy tap number in Act II, which was featured on the Tony Awards last summer. And starring in that number as Miss Shields is Caroline O’Connor, all you Moulin Rouge fans out there! Not to mention the ridiculously talented tapping child, Luke Spring. While the book is endearing, the musical is maybe 15 minutes too long, and there were a few things that let me down. I wanted Mother (Erin Dilly) to get an opportunity to let loose. The writers very much embrace the times here (the 1940s), and her two songs are the beautiful ballads about being a mother. But The Old Man (John Bolton) gets to go nuts with his award song. Also, Matt and I couldn’t figure out his character. One moment he seems pretty dumb, the next he’s cussing up a storm (albeit it’s fake cursing; is it like that in the movie? ), then he’s got this mean streak that scares the kids. Nonetheless, it was a very funny performance by Bolton. Mainly, what didn’t work for me was the narration led by Dan Lauria. This convention slowed things down. I’ve been told there is also a narrator figure in the film. Is it a voiceover? Perhaps it works better, but here he wanders around the stage like Ralphie’s odd shadow, interrupting the action to tell us things we already know. The role doesn’t particularly add to the material until the very end when he is able to articulate something young Ralphie cannot. I do wish I could have seen this when it was on Broadway in a more intimate house. Never thought I would call Broadway intimate, but man, the theatre is so large I felt miles away from the performers. But I would venture to say that if you’re a fan of the film, you’ll be a fan of the musical. If anything, you can always count on the handful of heartwarming moments that bring a tear to the eye. And ain’t that what Christmas musicals are for?